Ever since smartphones came into existence performing all the different tasks are just a click away. One such task while proved impossible a few years back was wireless printing. Smartphones have played a pivotal role in making this a reality. 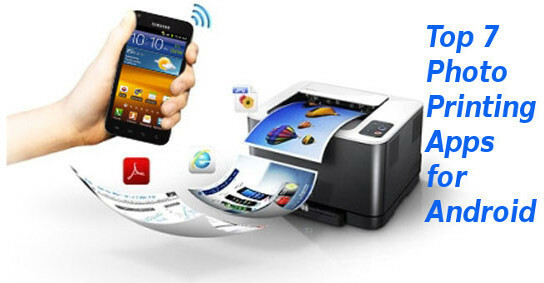 Any individual can easily connect a printer to his smartphone and give a print command wirelessly. However, as we all know that smartphones alone do not perform any task, it is the applications running in it that are responsible for the successful execution of the different tasks. Printing photos from an Android smartphone have only been possible due to the different printing apps. As there are a number of printing apps that are available on the play store choosing the best out of them can be a tedious task. In order to make it simple for you, I am going to showcase the top 7 photo printing apps which are best for Android. The Samsung Mobile Print app is recommended for all the Samsung printer users. Connecting your Android smartphone with your printer will become a seamless task. The app supports wireless printing, PDF, Scanning the documents, HTML web page files and text. With the help of the app, multiple files can be queued up for printing. The app comes with a rotate and crop tool that ensures that all the photos fit in a perfect manner in the paper. Sharing and scanning documents on the go are also possible with the help of Samsung mobile Print app. The app also has an option to order the Samsung printer cartridges from the Samsung retail stores. Epson is one of the prominent and famous printer manufacturing companies in the World. The official printing app from Epson will enable you to print, scan and share documents by making use of the swipe functionality. Just select all the files together and print them at once. Along with being compatible with the Word and the Excel files, the Epson Print app works seamlessly with the PDF documents. One of the great functionality of the app is that it allows a user to print an entire website from their Android phone. Cloud platforms like Dropbox, Google Drive, Evernote and One Drive are supported by the app. The HP iPrint Photo app has a support for more than 200 HP inkjet printers. Setting up the app is also quite easy and hassle free. The app has a few straightforward built-in tools that will enable a person to edit any particular photo on your Android phone before giving the print command. Along with Android, the app can also be Windows and iOS platforms. This makes it an all in one app no matter on which OS your smartphone runs. All those users that have a Brother printer they should definitely make use of the company’s iPrint & Scan app. The app will search the wireless network that is compatible with all the Brother printers. Go through the user manual that will assist you to configure the wireless settings of your printer properly. All the images can be scanned directly to your Android phone. However, in order to utilize the scan feature of the app along with printing the Brother printer should also have a scanner integrated into it. Polaroid PoGo is among the few apps that support Bluetooth printing. The app will enable you to add frames and custom borders to your images. There are different varieties of frames that the app will provide you. One amazing thing of the Polaroid PoGo App is that printing can be done from any kind of mobile phone that supports Bluetooth capabilities. This means that it doesn’t matter that you should have the latest android smartphone with you, any of the basic mobiles that come with the Bluetooth functionality can be used for printing the photos. Cloud Print is a printing app from Google that has all the necessary features of a printing app and is perfect for those users who just need the basic print functionalities. The cloud Print app will enable you to print to any of the Google Cloud connected printer. You can be anywhere in the World but the app will still function. All the images and documents that are saved in the gallery can be directly transferred to the Google cloud printer. Cloud Print is a simple and great app that will enable you to keep a track of all your jobs, print and also connect to the different printers. The Easy-PhotoPrint app by Canon for Android will enable any user to print any photo wirelessly on your Android phone or the SD Card. At a time, a user has a choice to print up to 39 photos. Along with the different photos, the type of the paper and the total number of copies that are to be printed can also be chosen. The app will search for all the compatible Canon printers on the wireless network. You can pick multiple pictures at once which makes the printer best for batch printing. All the apps that are mentioned in this article are among the best photo printing apps for Android. Depending on the brand of your printer you use you can choose any of the above apps to take out prints from your Android phone. These apps are quick and lightweight that will enable you to quickly go about your printing job.